When testing portable RCDs it’s extremely important to isolate the Residual Current Device on the main switchboard, so that in the event of the portable RCD being faulty, it won’t trip and take the power out on all appliances on the entire circuit. Because testing RCDs is essential, it’s vital that you have the tools to protect your business, its appliances and your employees. Without the Aegis Isolation Transformer, you run the risk of having your power go out while testing portable Residual Current Devices, which could lead to significant consequences. 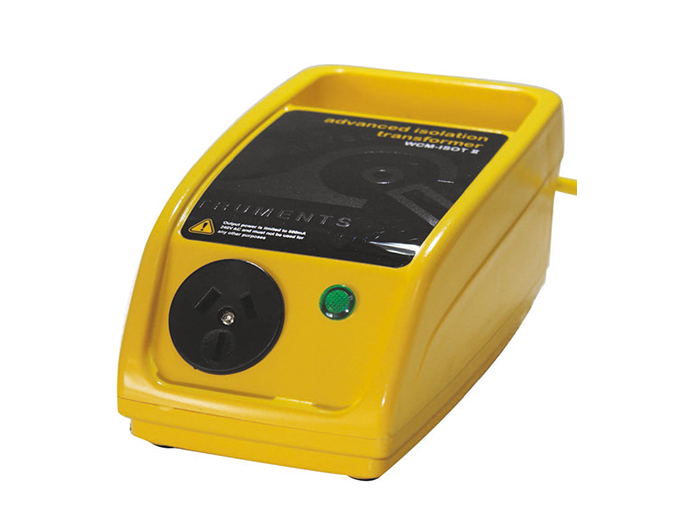 To ensure you do not cause any power outages while conducting your tests, the Isolation Transformer should be connected between the general purpose outlet and the portable Residual Current Device. This ensures that the trip current produced by your Portable Appliance Tester can not reach the main switchboard and take down the entire circuit. This simple device will save you affecting any others around you while still being able to continue testing normally. Safe and effective, the Isolation Transformer is an essential tool for your business. This Residual Current Device Tester is fully portable and comes equipped with everything you need to ensure that your Residual Current Devices (RCDs) are functioning correctly. The CZ20053 features multiple trip current ranges, 00 and 1800 phase testing, and high accuracy. The tests performed are all that is required for determining compliance to AS/NZS 3760:2010 for PAT testing requirements. Easily record all your test results in this convenient log book. The single item per page format allows many results to be stored for each appliance over time and provides a great history reference for each appliance. Each pack includes 100 Heavy Duty Test Tags of a single colour and a marker pen. All Aegis Test Tags comply with the requirements of AS/NZS3760:2010 and have a sign and seal security lamination flap which prevents tampering of the user's information and protects the tag in harsh environments. Each set is suitable for medium duty, heavy duty, thermal and wrap around PAT tagging. Available in the following colours: Red, Green, Blue, Yellow, Orange, Black, Burgundy. This pack includes 50 Heavy Duty Test Tags and a marker pen. These high quality tags are suitable for most environments and comply with the requirements of AS/NZS3760:2010. You can make sure that your business is complying to OH&S AS/NZS3760:2010 standards by testing all of your electrical appliances with the Patrol Pro. It will perform the essential electrical safety tests required for portable appliances and equipment and is an essential item for every workplace. Building on the simplicity of the CZ5000 Patrol, the Patrol Pro is the simplest 'run test' capable PAT on the market. The Patrol Pro features all the capabilities of the Patrol plus the ability to detect any earth leakages. This kit provides the ultimate testing solution by combining the CZ5000 Patrol Pro and the CZ20053 RCD Tester. With these two instruments you can test portable appliances and equipment, domestic appliances, industrial appliances, power tools, electrical portable outlet devices, extension leads and all portable residual current devices. The Aegis Patrol Pro and RCD tester in the one kit to suit all your testing and tagging needs. The Aegis CZ5000 Patrol is the simplest-to-use Portable Appliance Tester on the market.